Did ISIS Terrorists hijack a DTC Bus ? Did ISIS Terrorists hijack a DTC Bus ? 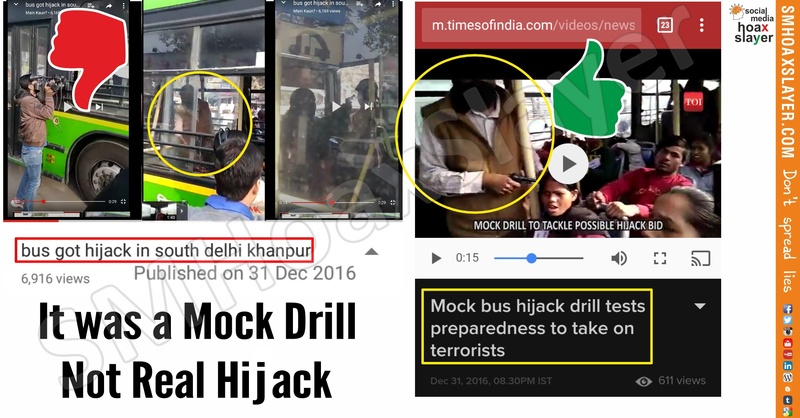 This Video is viral on WhatsApp claiming to be exclusive & fresh, ISIS Terrorists hijacked a DTC Bus. It does send chills down the spine, looks genuine, amateur camera work tells us it’s not a movie, the bus, people tells us, yes it’s India so looks true but there is a problem. Last December a Mock Drill was arranged by gov to teach people how to behave and over all what government can do in a real life hijack situation. This video is taken be someone in portrait mode by mobile while Times of India posted the same video in regular landscape mode. You can see many similarities especially the color and dress of hijackers and passengers which is same. Only the angle is different. And this video too was uploaded in December, which WhatsApp message claimed to be fresh. ← Neither are these women, nor did they strip against Modi Ji. Half news can be dangerous. She was forced to say Allah more than Jai Shree Ram. January 16, 2019 Shrimayee Thakur Comments Off on Did dancers perform to “Sandeshe aate hai” in America’s got Talent ?